The power industry is experiencing a fundamental change in the way it is managed and controlled. Increasing energy demand, restricted transmission grid expansion, and increasing volatility due to more renewable and distributed generation all add complexity across the electricity network. At the same time, transmission owners and ISOs have a constant responsibility to balance the costs incurred by operational constraints against grid reliability and the risks of major blackouts. Such constraints traditionally come from off-line planning studies, and tend to be static and overly conservative to accommodate a wide range of conceivable operating conditions and system contingencies, as well as unforeseen situations. For this reason, the transmission assets often remain underutilized. Fortunately, new technologies such as Wide Area Monitoring Systems (WAMS) and Phasor Measurement Units (PMUs), along with high performance computer processors, and advanced visualization platforms are all part of the emerging transmission information system. 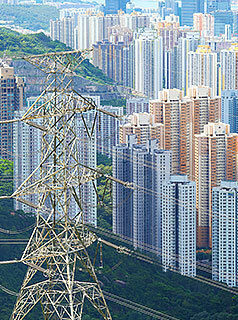 GE’s WAMS solutions improve on traditional SCADA-based energy management with a faster, more dynamic and proactive grid stability management approach, allowing grid operators to monitor and improve performance of transmission and distribution networks, reveal information about stability, system security and efficiency to enable Operators, Analysts and Planners to respond rapidly, accurately and appropriately to system conditions. GE’s WAMS solutions transform instantaneous synchrophasor measurements into valuable information through real-time “measurement-based” analytics, and combines them with “model-based” predictive visibility, providing advanced decision support tools to better assess grid reliability and maximize transfer capacity. This gives grid operators an holistic and accurate view of current grid status, better intelligence to understand, predict and mitigate potential developing events, and unmatched historical data quality for better offline post-event analysis, model tuning and power system control. Our WAMS solution is a hybrid measurement-based and model-based solution that combines real-time synchrophasor analytics with EMS-based network analysis and dynamic stability assessment tools, within a unified visualization platform to better manage grid reliability and maximize transfer capacity. Combines real-time SCADA and PMU data and analytics. Offline engineering analytics leverages PMU data alongside SCADA/EMS data and power system simulation results. Avoid blackouts via early detection of disturbances, quick grid vulnerability assessment, and overall assistance with system restoration. Tackle uncertainties associated with renewables and Distributed Generation (DG) with true dynamic situational awareness. Maximize transfer capacity for optimal grid utilization with real-time dynamic stability limits. Perform more accurate offline post-mortem analysis and dynamic model validation by leveraging time-synchronized, high-fidelity PMU measurements. Improve design and tuning of control systems through better diagnostics and system tests. Enhanced integration capabilities within Advanced EMS. GE’s Phasorpoint solutions architecture provides a full-range of building blocks for synchronised measurement and monitoring systems, including data management, archiving, visualisation and advanced applications. GE’s solutions are used by power system operators and planners worldwide for improving power system security, securely increasing power transfer levels, tracking power system performance including dynamics, model validation, tuning of power system stabilisers and more. GE's advanced Phasorpoint suite of power system performance and dynamics applications provides system operators with the capability to not just respond, but excel, in an increasingly volatile environment. Using the Phasorpoint Oscillatory Stability Management application (OSM), the behavior of different modes of oscillation can be monitored in real-time. The power through an interconnector can be increased further as long as the oscillation amplitude and damping are within preconfigured thresholds. Without modelling errors and the pessimistic assumptions used by the offline method, the real-time approach easily allows much more power to be transferred than the limit derived from the model-based method. Using GE's Phasorpoint solution the impact of renewable generation and network loading can be assessed by observing live data representing various power systems quantities such as real and reactive power flows, bus voltages, frequency and voltage angle differences. GE's advanced Phasorpoint suite of power system performance and dynamics applications give planners, analysts and operators access to key indicators that measure the static and dynamic performance of their system. The technology can provide operators with early warning of emerging dynamics issues in real-time, whilst providing planners and analysts with post-event information to use in studies. Key performance indicators are directly available within Phasorpoint and custom indicators can also be calculated using an array of flexible user-defined functions within the software. GE’s PhasorPoint solutions provide a fast and accurate means of measuring the actual dynamic performance of the power system. e‑terraphasorpoint provides system planners and analysts with powerful tools for system baselining and risk assessment, validation of dynamic models, post-event analysis, investigating dynamics problems and developing operational rules based on system dynamic measurements. At GE, we want to ensure that any system we implement is utilized to its full potential. By leveraging our extensive experience in delivering synchrophasor based solutions worldwide, GE is able to offer a comprehensive range of services to enable utilities to get the most out of their systems. GE has extensive experience in the specification, design, and deployment of synchrophasor based systems worldwide. We can design Wide Area Management Systems (WAMS) ranging from small-pilot schemes right up to large-scale deployments that are flexible, scalable and reliable. We also can assist operationally in the deployment of these systems. Our approach ensures that the WAMS design is suitable for the available or planned communications infrastructure, and that the appropriate synchrophasor data concentrator architecture, applications and integration are delivered. Furthermore, where synchrophasor measurements are already available GE will advise customers on how to get the most out of their existing measurement investment whilst at the same time leveraging the benefits of GE's Phasorpoint data management facilities and advanced applications. The effective management of generator dynamics is key to maintaining power system security and for achieving high transmission performance levels. A lack of stabilisers, or poor stabiliser tuning can significantly impact the requirement to ensure that power system oscillations remain adequately damped at all times. For network operators, model-based network analysis is an essential step towards making new planning or operation decisions. The analysis results must show that the operational or physical change to the electrical network will not cause any degradation in supply security and reliability; otherwise the proposed change would be rejected. The power systems team at GE has an extensive first-hand experience in analysing steady-state and dynamic behaviours of electrical network at different voltage levels, from transmission to distribution. GE's training service aims to deliver know-how on Wide Area Management System (WAMS) technology and Phasorpoint solutions. In addition training often promotes discussions on operational procedures based on Phasorpoint alarms and the case study that customers review.